This week I re acclimated myself with two long lost loves. 1. Iceberg lettuce (pipe down health nuts, I know it basically has the nutritional value of a glass of water) and 2. Bacon. I know what you’re thinking, “Amy – most of your posts have bacon in it somewhere, I’d hardly qualify bacon as a long lost love…”, but if you skeptics would take a look, I have not worked with my sweet sweet love in a long while. Too long of a while. And hey, at least this time it’s showing up in a salad! 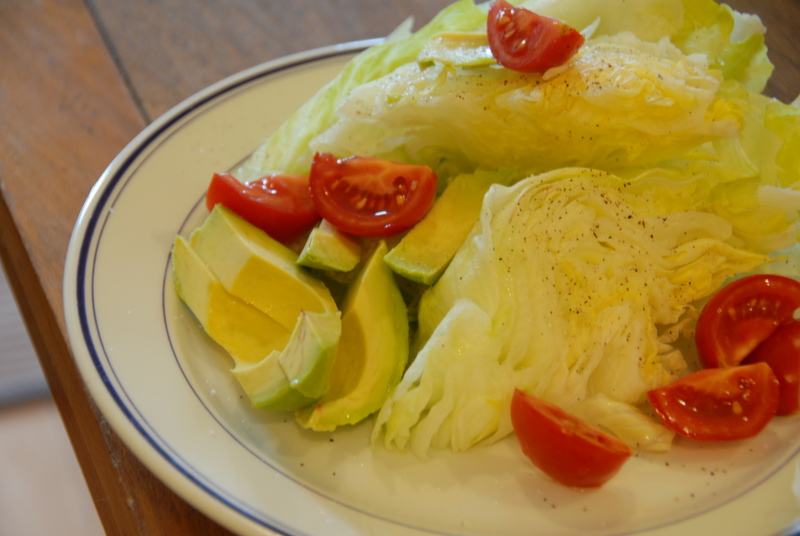 The classic wedge is bit of a wolf in sheep’s clothing situation – technically a salad, but only because of the lettuce. A salad certainly loses it’s healthy status when you smother the thing with blue cheese and bacon. 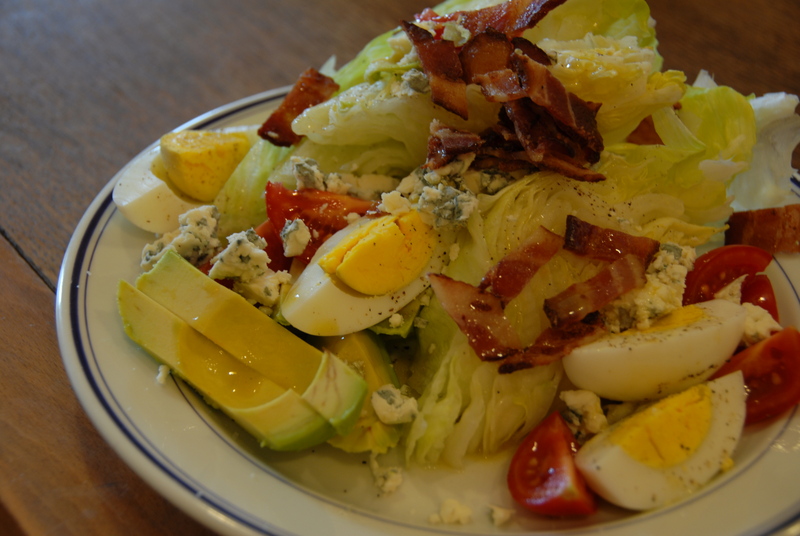 At least the presence of a rich and creamy avocado, hard boiled egg and light lemon vinaigrette might help to redeem its healthy rep. It’s no wonder this dish used to grace so many restaurant menus – the watery iceberg is the perfect vehicle to consume fatty, smoky bacon, and tangy Gorgonzola. I suggest you get reacquainted with this classic as well. For the vinaigrette: place the garlic, salt and pepper, lemon juice, zest and vinegar in a jar that can be sealed. Let that sit while prepping other ingredients. Ready salad ingredients for assembly: Prepare a hard boiled egg (Just cover the eggs with water in a pot. Bring to a boil, cover and remove from heat for 12 minutes. After the 12 minutes run the eggs under cold water, peel). Slice the head of iceberg in quarters, wash and remove the core. Run a sharp knife along the long edge of the avocado, remove the pit and slice the meat into long slices. Slice the tomatoes and sprinkle with salt. (For those of you who don’t usually salt their tomatoes – try it! It makes an unbelievable difference, especially since it’s not quite tomato season.) Cook the bacon and slice. Crumble the Gorgonzola. 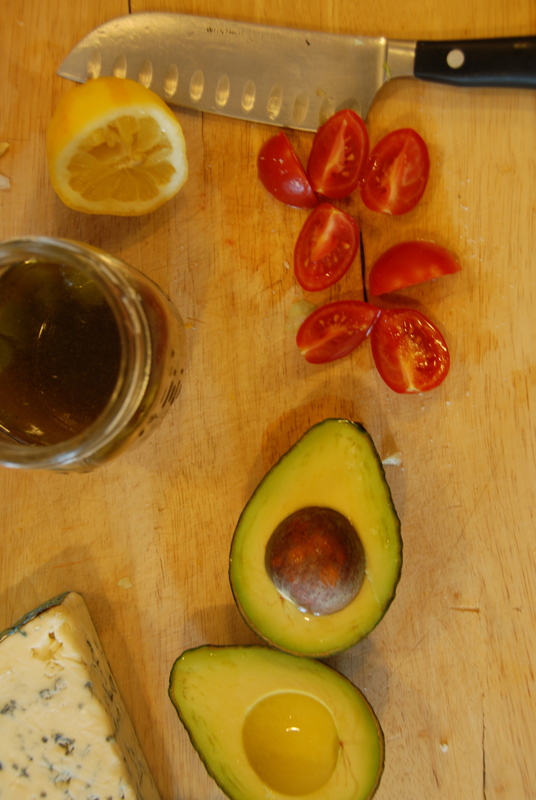 When you’re ready to assemble the salad, finish the vinaigrette by adding the Dijon, olive oil and shake vigorously. Taste for seasoning. Assembly: place wedge, avocado and tomatoes on a plate…but don’t stop there… When this what you really want…top it with the eggs, bacon, cheese and lemon dressing. Absolutely delicious. This entry was posted in Avocados, Bacon, Eggs, Lemon, Tomatoes and tagged avocado, bacon, cherr tomatoes, hard boiled eggs, health nuts, iceberg, lemon vinaigrette, lettuce, wedge salad. Bookmark the permalink. Love your blog! The wedge, and of course bacon, are among some of my favorites as well!